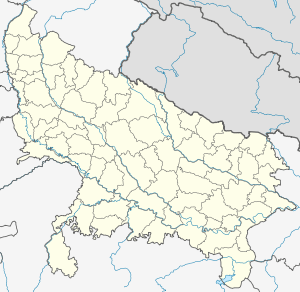 Kushinagar, Kusinagar or Kusinara is a town and a Nagar Panchayat in the Kushinagar district of the Indian state of Uttar Pradesh located around NH-28, and is 52 km east of Gorakhpur city. The Government of Uttar Pradesh has proposed Kushinagar-Sarnath Buddha Expressway to connect Buddhist pilgrimage towns. The expressway will be around 200 km long and will reduce the distance from both town from Seven hours to one and half hours. The expressway will also promote easy accessibility from other East UP towns to proposed AIIMS near Gorakhpur. 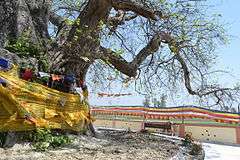 It is an important Buddhist pilgrimage site, where Buddhists believe Gautama Buddha attained Parinirvana after his death. Outside India, it is an International Buddhist Pilgrimage Centre. The followers of Buddhism, especially from Asian countries, wish to visit this place at least once in their lifetime. 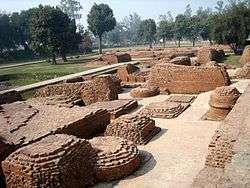 The present Kushinagar is identified with Kushawati( in pre-Buddha period ) and Kushinara (in Buddha period). Kushinara was the capital of Mallas which was one of the sixteen mahajanpads of the 6th Century B.C. Since then, it remained an integral part of the erstwhile empires of Maurya, Shunga, Kushana, Gupta and Harsha dynasties. In medieval period, Kushinagar had passed under the suzerainty of Kultury Kings. Kushinara continued to be a living city till the 12th Century A.D. and was thereafter lost into oblivion. Padrauna is believed to be ruled over by a Rajput adventurer, Madan Singh in the 15th century A.D.
Chandra Swami, a Burmese Monk, came to India in 1903 and made "Mahaparinirvana Temple" into a living shrine. After independence, Kushinagar remained the part of district Deoria. On 13 May 1994, it came into being as a new district of Uttar Pradesh. In 1896, Waddell suggested that the site of the death and parinirvana of Gautama Buddha was in the region of Rampurva. However, according to Maha-parinirvana Sutta, the Buddha made his journey to Kushinagar, died there and wherein he was cremated. 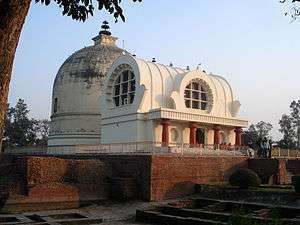 Modern scholarship, based on archaeological evidence, believes that the Buddha died in Kushinagar, close to the modern Kasia (Uttar Pradesh). 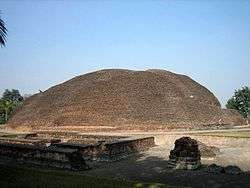 Ashoka built a stupa and pilgrimage site to mark Buddha's parinirvana in Kushinagara. The Hindu kings of Gupta dynasty period (4th to 7th century CE) helped greatly enlarge the Nirvana stupa and Kushinagar site, building a temple with reclining Buddha. This site was abandoned by Buddhist monks around 1200 CE, who flee to escape the invading Muslim army, after which the site decayed over the Islamic rule in India that followed. The British archaeologist Alexander Cunningham rediscovered Kushinagara in late 19th-century and his colleague A. C. L. Carlleyle unearthed the 1,500 year old Buddha image. 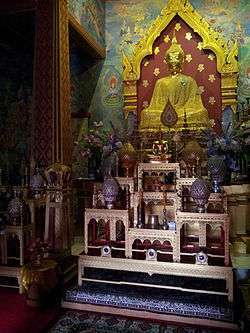 The site has since then become an important pilgrimage site for Buddhists. Archaeological evidence from the 3rd century BCE suggests that the Kushinagara site was an ancient pilgrimage site. Kushinagar is situated at 53 km east from Gorakhpur on the National Highway -28, lies between latitude 26° 45´ N and 83° 24´ E. Gorakhpur is the main railway terminus for Kushinagar while air strip of U.P. Civil Aviation is available in Kasia, 5 km. from Kushinagar. Golden Statue of Buddha in Wat Thai Kushinara Temple. The reclining Nirvana statue of the Buddha is inside the Parinirvana Stupa. Statue is 6.10 metres long and is made of monolith red - sand stone. It represents the "Dying Buddha" reclining on his right side with his face towards the west. It is placed on a large brick-pedestal with stone-posts at the corners. Nirvana Chaitya is located just behind the Main Parinirvana Temple. It was excavated by Carlleyle in the year 1876. During excavations, a copper-plate was found, which contained the text of the "Nidana-Sutra" which concluded the statement that plate had been deposited in the "Nirvana-Chaitya" by one Haribala, who also installed the great Nirvana Statue of Buddha in the temple front. Ramabhar Stupa Ramabhar Stupa, also called a Mukutbandhan-Chaitya, is the cremation -place of Buddha. This Site is 1.5 km east of the main Nirvana Temple on the Kushinagar-Deoria road. Matha Kuar Shrine A Colossal statue of Lord Buddha is installed, which is carved out of one block which represents Buddha seated under the "Bodhi Tree" in a pose known as " Bhumi Sparsh Mudra " (Earth touching attitude). The inscription at the base of statue is datable to the 10th or 11th Century A.D. Ruins & Brick Structures: These are located around the main Nirvana Temple and Main Stupa. These are the remains of various monasteries of different sizes constructed from time to time in the ancient period. Current Member of legislative assembly(MLA) from Kushinagar Assembly constituency is Brahma Shankar Tripathi of Samajwadi Party who is also minister in Government of Uttar Pradesh. Sachchidananda Vatsyayan 'Agyeya' (सच्चिदानंद हीरानंद वात्स्यायन 'अज्ञेय') was a notable Indian Hindi Writer. Ram Nagina Mishra was a former Loksabha M.P. from Kushinagar. Baleshwar Yadav was a former Loksabha M.P. from Kushinagar. Rajesh Pandey is a member of 16th Loksabha from Kushi Nagar (Lok Sabha constituency) and also served as a Member of Legislative Council in Uttar Pradesh. R. P. N. Singh was former member of parliament from Kushi Nagar (Lok Sabha constituency) from Indian National Congress. He also served as Minister of State for Road and Transport, Minister of State for Petroleum and Natural Gas in Dr. Manmohan Singh Cabinet. He was also member of many parliamentary committees. 1 2 3 "Kushinagar City Census". census2011. Retrieved 17 July 2015. 1 2 "Kushinagar". official government website of Kushinagar. Retrieved 17 July 2015. ↑ Census of India: Population Finder, http://censusindia.gov.in/PopulationFinder/View_Village_Population.aspx?pcaid=1249&category=N.P. ↑ "Kushinagar History". kushinagar.nic.in. Retrieved 18 July 2015. ↑ "A Tibetan Guide-book to the Lost Sites of the Buddha's Birth and Death", L. A. Waddell. Journal of the Asiatic Society of Bengal, 1896, p. 279. 1 2 3 Lars Fogelin (2015). An Archaeological History of Indian Buddhism. Oxford University Press. pp. 23–24. ISBN 978-0-19-994822-2. ↑ John Guy (1991). "The Mahabodhi temple". The Burlington Magazine. 133 (1059): 356–357. JSTOR 884751. ↑ United Nations (2003). Promotion of Buddhist Tourism Circuits in Selected Asian Countries. United Nations Publications. pp. 23–24. ISBN 978-92-1-120386-8. ↑ Kevin Trainor (2004). Buddhism: The Illustrated Guide. Oxford University Press. p. 41. ISBN 978-0-19-517398-7. Fred S. Kleiner (2009). Gardner's Art through the Ages: Non-Western Perspectives. Cengage. pp. 13, 31. ISBN 0-495-57367-1. ↑ Akira Hirakawa; Paul Groner (1993). A History of Indian Buddhism: From Śākyamuni to Early Mahāyāna. Motilal Banarsidass. p. 101. ISBN 978-81-208-0955-0. ↑ Gina Barns (1995). "An Introduction to Buddhist Archaeology". World Archaeology. 27 (2): 166–168. 1 2 Robert Stoddard (2010). "The Geography of Buddhist Pilgrimage in Asia". Pilgrimage and Buddhist Art. Yale University Press. 178: 3–4. ↑ Richard H. Robinson; Sandra Ann Wawrytko; Ṭhānissaro Bhikkhu (1996). The Buddhist Religion: A Historical Introduction. Thomson. p. 50. ISBN 978-0-534-20718-2. ↑ Mark Juergensmeyer; Wade Clark Roof (2011). Encyclopedia of Global Religion. SAGE Publications. p. 148. ISBN 978-1-4522-6656-5. ↑ Asher, Frederick (2009). "From place to sight: locations of the Buddha´s life". Artibus Asiae. 69 (2): 244. ↑ Himanshu Prabha Ray (2014). The Return of the Buddha: Ancient Symbols for a New Nation. Routledge. pp. 74–75, 86. ISBN 978-1-317-56006-7. ↑ Lars Fogelin (2006). Archaeology of Early Buddhism. AltaMira Press. pp. 42–43. ISBN 978-0-7591-1444-9. 1 2 "Kushinagar geography". kushinagr.nic.in. Retrieved 18 July 2015. ↑ "Kushinagar". onefivenine. Retrieved 18 July 2015. 1 2 3 4 5 6 7 "Places in Kushinagar". kushinager.nic.in. Retrieved 17 July 2015. ↑ "Kushinagar Loksabha". elections. Retrieved 18 July 2015. ↑ "Kushinagar Assembly". empowering india. Retrieved 18 July 2015.